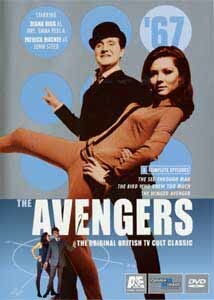 "The Avengers has made a deserved return (in living color), because it is one of the small handful of consistently inventive, offbeat and thoroughly entertaining programs on television." Some manages to break in, unseen, at the Ministry of Defence! We (and our heroes) are led to believe it has been to steal some forgotten invention proposed by one Professor Quimbly.... But if this were so, then how could the intruder have been invisible when he sneaked in? This one sort of continues this way, bringing back the fumbling Brodny, a simpering, imbecilic ambassador from the "East", who offers no real resistance to the inquisitive Steed, as usual. Quimbly is a fun, precarious character, but too predictable to be interesting. And even Mrs. Peel seems predictable, out of character, making this possibly the weakest episode to date. The premise seems so absurd that it is just asking too much, I think, of the viewer's ability to suspend disbelief.... And, just when I felt I was about to give in and believe, they snatched it all away, too it all back, and proved it was all a hoax. I would rather have been caught "believing" in an invisible man, than the impossibly far-fetched concoction it all turned out to be. Note to the continuity editor: After the "invisible" Major Vazim manages to run Mrs. Peel off the road, through his open car door we see him, don't see him, see him... did he strip naked for a second there, then get dressed again? And—how he drove his car by remote control is not covered in the finally explanation of the hoax, now, is it? Libations: Dry—I know I was left thirsty for something. This episode is worth 2-1/2 libations. An operative, found shot to death, seems to have been smuggling birdseed. Another agent, with an interest in carrier pigeons, is murdered next. While Steed chats up the victim's favorite "bird", Emma is on the trail of the elusive "Captain Crusoe", the name uttered by the dying agent. When aerial photos of a secret missile installation are discovered, it seems to take our brilliant sleuths much too long to realize the birds are key to this intrigue. I believe the villains in this plot are some of the deadliest so far—something about them seems more serious and bloody. Yet for all their talk about killing Steed, and a failed attempt to blow him up (the old mini-grenade-in-the-brollie scheme), when one of them finally gets near him, he seems satisfied to knock him out and walk away! There is also an elaborate set up, with Emma gagged and bound to a chair, and a booby-trap set to kill her when someone opens door. As interesting as this is, I found myself longing for modern killings like Indiana Jones, facing that swordsman in the marketplace—how often do we find ourselves yelling "JUST SHOOT HIM" at the screen...? This episode, I'm afraid, is for the birds. Note to continuity editor: When the brollie-bomb explodes, the lavender doorway takes a beating, but is miraculously mended by the next evening. And when Emma pulls up to the big house, she parks right in front, but a minute later as the camera shows us the sniper's view, it's gone! Libations: Steed: Tea, wine and champagne; Emma deserves her champagne. It had its moments—I'll rate it worth 3 libations. The above quote is made by the son of the publisher who has met a ghastly end - in the next scene the son meets the same fate. The corpse count is four, all men in "high places", both figuratively and literally: well-to-do gents who tend to live "at the top of buildings". It is indeed a huge bird, a man dressed as an avenging comic strip character who has some scores to settle with each victim. This episode has many lively elements that support a teetering plot. There is again the integration of the "Batman Theme", this time complete with its comic book use of "WHAM!" and "Splat!" And there are fabulous transitions between the ink and color storyboards cutting to live action as the artist leaves clues that Steed follows. A fan favorite, the right blend of Avengerisms to carry the day. Libations: Too busy for drinkies, I guess. Not me - I raised my glass 4 times for this one! Image Transfer Review: Now over the shock of color, it seems they got it down for this second disc. The colors are smooth and even, a bit of the washed out look 60's TV seems to have to us today, butI blame it on the "palette" of the time more than anything. No noticable flaws, wholly watchable. Audio Transfer Review: I just have nothing new to say here, every disc thus far has been consistant. The theme has always been stunning, an icon of the era, and the music chosen for individual episodes is, in most cases, equal to the scenes they underscore. From the comedic scenes to the height of suspense, the tracks are almost always right on. Extras Review: I'm told by our other Avenger's reviewer, Mark Zimmer, that A&E produced the color series first - this explains in a snap to me why the design of the black & white series is so much better. The overall package design for the color series is a disappointment, flat and muddy-colored and nowhere near as exciting. The menu is a snappier, more 3D sort of interface, but I really prefer the look & feel of the flatter, more 60's approach to the interface in the b&w series. The problems here arethe same: too many clicks to navigate the chapters, etc. The extras consist of a gallery of stills from individual episodes included on each disc - these are a bit bigger and so easier to enjoy, but I found the tabular interface confusing, and the number of images disappointing. Every disc also has a menu link to A&E's "www.originalavengers.com", a good marketing move but poorly executed - why not give us a real taste of what's in store for us there? Bios, interviews, scripts—all would be welcomed by aficionados and newcomers alike. The episodes on this disc are superior to the the first '67 disc, making this an enjoyable experience. I'm a happy fan.Cheers. Salute. Bottoms up. And them some...I give this disc 3-1/2 of 5.